The Science and Entertainment Exchange, along with Cultural Programs of the National Academy of Sciences, sponsored a special advance screening of the film Obselidia in Washington, D.C., this past Tuesday (April 6th). The film was directed by Diane Bell and played at the 2010 Sundance Film Festival where it won of the Alfred P. Sloan Prize – an award given to a feature film that has science or technology as a major theme or a scientist, engineer, or mathematician as a main character in the storyline. Obselidia explores our attitudes toward technology and how we think about a future that’s bound to be severely altered by environmental change. In the film, George, an encyclopedia salesman, shuns new technology. After the Internet wipes out his livelihood, he endeavors to write The Obselidia, a compendium of everything that is obsolete – including love. Along the way, George meets and befriends Sophie, a beautiful cinema projectionist who works at a silent movie theater. She feels that nothing is obsolete as long as someone loves it. The two travel to Death Valley to interview a reclusive scientist who predicts that 80 percent of the world’s population will be obliterated by irreversible climate change by the year 2100. George and Sophie must then grapple with a difficult question: if the world is not going to exist tomorrow, how are they going to live today? Obselidia offers a rare and humane lens through which we can view a world increasingly preoccupied with and inhabited by extinction. After the screening, the audience enjoyed a panel discussion centered on the film’s portrayal of science and technology, moderated by Kevin Finneran, Editor-in-Chief of Issues in Science and Technology. Panelists included Diane Bell, earth scientist Tony Busalacchi, and Daniel Sarewitz, director of the Consortium on Science, Policy, and Outcomes, based at Arizona State University. There were a wide variety of questions touched on during the panel. The discussion underlined many common themes that cut to the core of the mission of The Science & Entertainment Exchange: the intersection of science and media, the implications of scientific achievement, the portrayal of scientists in film, etc. Much of the conversation centered on the idea that although we often celebrate the benefits of new technology – iPad anyone? – we seldom acknowledge what we’ve lost when we embrace technology. We have an obsession with what’s new, but we don’t think about what we give up when we stop doing things the old way. Daniel Sarewitz specifically pointed out that the film brought to the surface the idea that technological advancement is as much about what is cool and new as it is about giving up the past, the death of old ways, and loss. 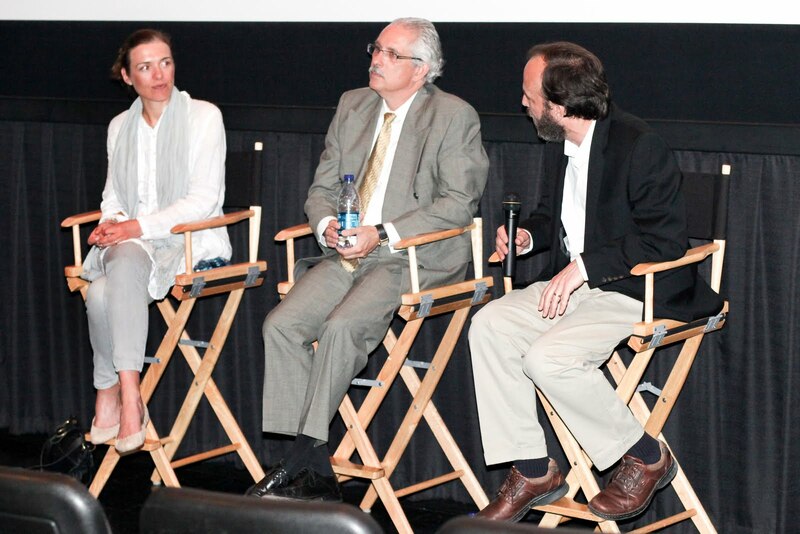 Director Diane Bell also shed light on many interesting aspects of the film’s production and her research. When asked if her climate scientist character, who was an iconic representation portrayed as one of the first people to sound the alarm about climate change, was based on famed climate scientist James Hansen, Diane responded that she based her character not on Hanson, but on James Lovelock, founder of the Gaia Theory. As we often find at The Exchange, science and scientists can inspire great art, like the movie Obselidia, just as Diane Bell’s film inspires everyone who sees it to think more deeply about all that technology has to give, and what it may take away.